Ever wanted an easy hiking day when you could knock off two hikes, go ocean gazing, see a lighthouse, and eat at one of the best lobster-eating spots all at the same time? We here at the Mira Monte have been advising this little tour for several years now for those looking to get outside without exerting too much physical effort. It takes about 2-4 hours if done at the right time, and that includes the eating part, too! Drive through Southwest Harbor and take a left onto Rt 102, also known as Seawall Rd. After driving about 10 min, you’ll come to Seawall, a beautiful, natural sea wall with tide pools to explore and fantastic granite rocks to lie down, read a book, and watch the boats float by the southern shores of Mount Desert Island. If you don’t do the lobster pound noted below, this is a fantastic picnic spot. From there, head down the road about two minutes until you come to the Wonderland and Ship Harbor parking lots. They are about 100 yards apart from each other, so if you can’t get parking in one, try the other. Each hike is about a 20-40 minute hike out to the sea and back. Wonderland has a bit more spread-out views, similar to Seawall, while Ship Harbor has a deceptively shallow harbor to explore (especially at low tide) where more than a few ships have been wrecked. 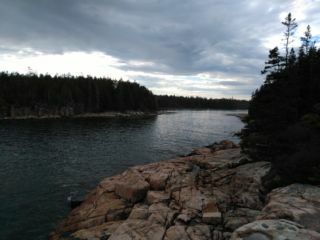 From these two hikes, head a bit more down the road and come to Bass Harbor Head Light. Parking here can be difficult, but just because you see cars parked on the side of the road doesn’t mean it’s full in the lot. There are two ways to see the lighthouse, off to the right (a paved path that takes you down by the bell) and off to the left (wooden steps that lead out on to the rocky foundation of the lighthouse itself). The left-hand walk (no more than 5min) is a very popular sunset destination. Finally, if you’re in the area between about 1:30pm and 5:30pm, head over to the other side of Bass Harbor to the town of Bernard and sit outside on the deck of the working-dock restaurant known as Thurston’s. Not only is this one of the most beautiful, rustic spots to eat, but the value is fantastic, too. They are open more than just during these times, but Thurston’s can get quite busy at lunch and dinner. To book your stay at Mira Monte and get more hiking tips, check out our availability calendar here. See you soon!